What caused the war? Why did the Union defeat the Confederacy? What were the consequences of the War? What caused the war? Why did the Union defeat the Confederacy? What were the consequences of the War? The premise of the book is that historians have a comparative advantage in describing such events, but economists have the tools to help explain these events. This book does so, and marvelously. The authors use Austrian and Public Choice analysis to address these principal questions and our conclusions generally run counter to the interpretations of historians. In contrast to historians who emphasize the land war and military strategy, the authors show that the most important battle took place at sea. One side, the blockade runners, did not wear uniforms or fire weapons at their opponents. The other side, the blockading fleet, was composed of sailors who had weapons and guns but they rarely fired their cannons in hopes of damaging their opponents. Their pay was based on the value of captured ships. Historians often have argued that the Confederacy lost because it was overly reluctant to use government power and economic controls, but we show the exact opposite. Big Confederate government brought the Confederacy to its knees. Some now teach that slavery was the sole cause of the Civil War –- an explanation that historians have developed in the twentieth century. However, this analysis does not explain why the war started in 1861 (rather than 1851 or 1841) and it fails to explain why slavery was abolished elsewhere without such horrendous carnage. 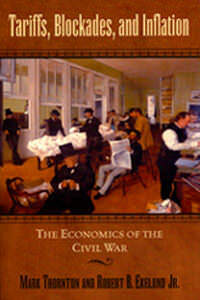 The authors emphasize economics and politics as major factors leading to war. The Republicans who came to power in 1860 supported a mercantilist economic agenda of protectionism, inflation, public works, and big government. High tariffs would have been a boon to manufacturing and mining in the north, but would have been paid largely by those in the export-oriented agriculture economy. Southern economic interests understood the effects of these policies and decided to leave the union. The war was clearly related to slavery, but mainly in the sense that Republican tariffs would have squeezed the profitability out of the slave-based cotton plantation economy to the benefit of Northern industry (especially Yankee textiles and iron manufacturing). Southerners would also have lost out in terms of public works projects, government land giveaways, and inflation. The real truth about wars is that they are not started over principle, but over power. Wars, however, are not won by power on the battlefield, but by the workings and incentives of men who go to work in fields and factories, to those who transport, store and sell consumer goods, and especially to the entrepreneurs and middlemen who make markets work and adapt to change. This emphasis and this economic account of tariffs, blockade, and inflation reveals the most important and least understood aspect of war. the single sentence...."wars...not started over principle, but over power" is perfect. That's it. It is ridiculous of anyone to believe that hundreds of thousands of soldiers would want to fight and die to free anyone from anything....unless it's themselves. Nations fight wars for one of two reasons, I believe: self-preservation or economics.